A Melodic Chromatic Scale sounds the same but is written in different ways. A Melodic Chromatic Scale may be written in a “Set Form”. A "Set Form" means that a scale is written using a set pattern of notes. In a Harmonic Chromatic Scale, the “Set Form” is that the Tonic, Dominant and Upper Tonic notes are only written once. All other notes are written twice. Therefore the notes in the ascending and descending Harmonic Chromatic Scale are the same notes. A letter name may be used twice in a row, but never more than twice in a row. There will always be 5 single notes – 5 letter names that are only used once. In a Melodic Chromatic Scale using a “Set Form”, the notes are not the same in the ascending and descending Melodic Chromatic Scale. So, how can it have a “Set Form”? Easy! There are 3 Steps to writing a Melodic Chromatic Scale using a Set Form. So, yup, you guessed it – grab that Ultimate Whiteboard or download Staff Paper for free from our Website. Follow the instructions for each step and then check your work. Let’s write a Melodic Chromatic Scale using a Set Form beginning on E. Use accidentals. Use whole notes. UMT Tip: If you are asked to use a Key Signature, you always use the Major Key Signature of the given Tonic Note. Ascend: iii - ___; vii - ___; VIII/Upper I - ___. Descend: IV - ___; I - ___. Based on the Major Key of the Tonic Note, the Melodic Chromatic Scale will use a single Mediant, Leading Note and Upper Tonic ascending, and a single Subdominant and Tonic descending. Ascend: iii - G# ; vii - D# ; VIII/Upper I - E . Descend: IV - A ; I - E .
Step #3: Add the necessary accidentals to create the Melodic Chromatic Scale beginning on E! Yes, you just might get a chance to use a double sharp – finally! Yahoo! This is a Melodic Chromatic Scale because different letter names are used in the ascending and descending scales. It uses a “Set Form” as there is always a single Mediant, Leading Note and Upper Tonic ascending, and a single Subdominant and Tonic descending. Isn’t learning all these little tidbits of theory fun! Want to learn more? Check out our exclusive course for teachers! 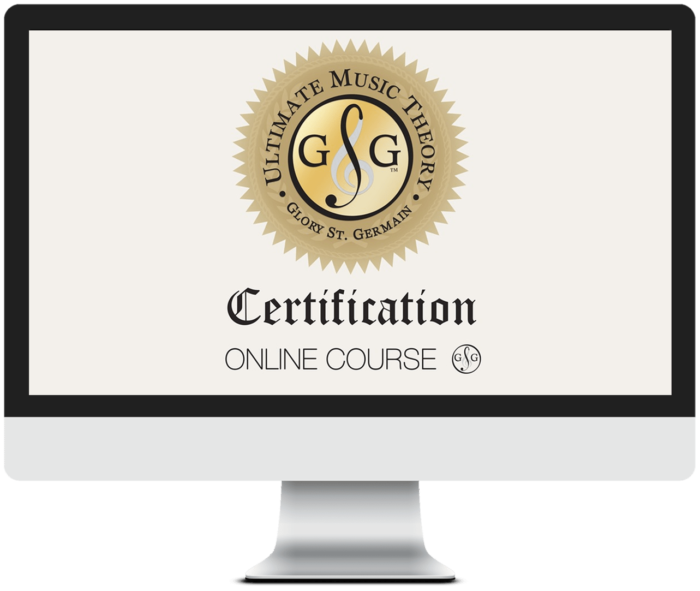 The Online Ultimate Music Theory Certification Course! The Ultimate Music Theory Certification Course for teachers is a pedagogical teaching program that will give you the secret to understanding learning styles and rapport building techniques using Neuro-Linguistic Programming that makes your students addicted to learning ALL while using the power of teaching with passion – covering Basic, Intermediate and Advanced Rudiments. PS – Join the Conversation: When asked to write a Chromatic Scale, you will be asked to write one using “any standard form”. You can also write a Chromatic Scale with a center bar line and without a center bar line. There is no “right” or “wrong” here, but just out of curiosity… What form of Chromatic Scale do you prefer to write and do you prefer to write with or without a center bar line?